Objective: This study aimed to describe the clinical results of intrahemorrhoidal application of a diode laser. Background Data: Hemorrhoids are a common source of pain, and no surgical technique achieves a painless outcome. 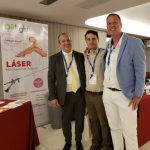 Endovascular laser therapy for varicose veins as described in an experimental study is a method that could be used in the treatment of hemorrhoids, but there are few clinical trials described in the literature. Materials and Methods: Fifteen patients with second and third degree hemorrhoids underwent intrahemorrhoidal laser therapy. After the piles were identified, a fiber was introduced into each and it was irradiated with laser energy (810 nm, 5W, frequency of 5 Hz, energy density of 19 J=cm2, total energy of 4–10 J). Results: The piles were immediately partially reduced, and clinical examination 7, 14, 21, and 28 d after surgery showed complete healing in nine patients (60.4%) and partial resolution in five patients (33%). In one patient (6.6%) the treatment failed. Mean pain intensity throughout the study period, measured by a visual analog scale (0–10), was 0.841.13 (meanSD). Major complications were burn lesions (n¼4) and residual plicoma (skin tag) (n¼5). Ten control patients underwent an open ‘‘cold scalpel’’ hemorrhoidectomy. Their pain intensity was 1.780.68 (meanSD). There was a significant statistical difference ( p¼0.018) between groups. Conclusion: The diode laser energy delivered into small to median hemorrhoidal piles caused little pain and led to a partial to complete resolution within a short time compared to open hemorrhoidectomy. Some adjustments must be made to prevent burning lesions and residual plicoma. 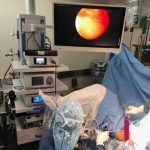 Although it is not a good method for big piles, this technique opens new possibilities for surgical treatment of hemorrhoidal disease. Objective: Detailed here is an experimental model in monkeys of a new approach to treat hemorrhoids using a diode laser. Background Data: Hemorrhoids are a common source of pain and suffering. 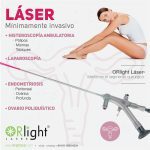 Endovascular laser therapy for variceal veins is a method that potentially could be used in the treatment of hemorrhoids. There is currently no such method described in the literature. Materials and Methods: Hemorrhoids were induced in monkeys by ligation of the inferior hemorrhoidal vein, similar to their cause in humans. After the piles were identified, laser fibers were introduced into them, and they were irradiated with laser energy (810 nm at 1–2 W in 1-sec pulses of 1–2 J each, for a total fluency of 4–10 J). Results: The piles were completely reduced, and histological examination performed 10 d post-surgery showed reduction of the dilated vessels and complete healing. 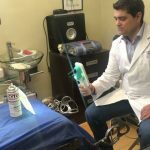 The laser energy was not delivered directly into the veins, but instead to the surrounding submucosal interstitial tissue, effectively reducing the hemorrhoids. Conclusion: The diode laser energy delivered into the hemorrhoids led to their complete resolution. Further clinical trials using this protocol must be carried out to determine its applicability to human hemorrhoids.